Welcome to the capital of Azerbaijan, Baku. Your exciting holiday kicks off as you arrive at the airport. Get acquainted with our professional guide and driver who will transfer you to the hotel for check-in. Overnight in Baku. Our tour starts from the highest pick of the city named Highland Park for amazing city panorama and photo stop. The park is located in the center of Baku. It is one of the most popular places of the local residents and tourists. In Soviet period (1920-1991), this park was named after Sergei Kirov. The most unique side of the park and the reason why it is actually, called the “Highland Park” is its impressive panorama looking over Baku city, Baku bay and Baku Boulevard stretching along the Caspian sea. In 1930s when the master plan of Baku was started, Highland park was considered as an important element of the general architectural composition of the city. The park was founded in the place of the old graveyard based on the design of architect Ilyin using the varieties of limestone found in Absheron Peninsula. Another old name of the park – the English park – is originated from the fact that in 1920s, English soldiers who sent to Baku after the fall of the Russian Emperor were buried here along with the victims of March 1918 massacre of Azerbaijan people. Azerbaijan Independence Museum, Martyrs’ Lane where lie the victims of Black January of 1990 and those who were killed in Nagorno Karabakh war are also buried in the Highland Park. Continue out tour to the old city of Baku- Icherisheher. It covers twenty-two hectares of territory and includes hundreds of monuments; this urban complex is an outstanding testament to architecture. In Icherisheher, there are four monuments of world-class value: Icherisheher, the complex of Shirvanshah’s Palace, Maiden Tower, and Muhammed Mosque. Due to the cultural significance and uniqueness, the entire Icherisheher including Shirvanshah’s Palace and Maiden Tower are all inscribed on the World Heritage List, which is composed from twenty-six architectural and three archaeological monuments of national value and more than six hundred at regional level. Besides, there are also many magnificent samples of inhabited architecture of the late 18th and early 19th centuries in the territory. The history of Icherisheher goes back to the beginning of AD. There are hundreds of mosques from the late Middle Ages as well as caravansaries, baths and “ovdans”, mausoleums and many others. 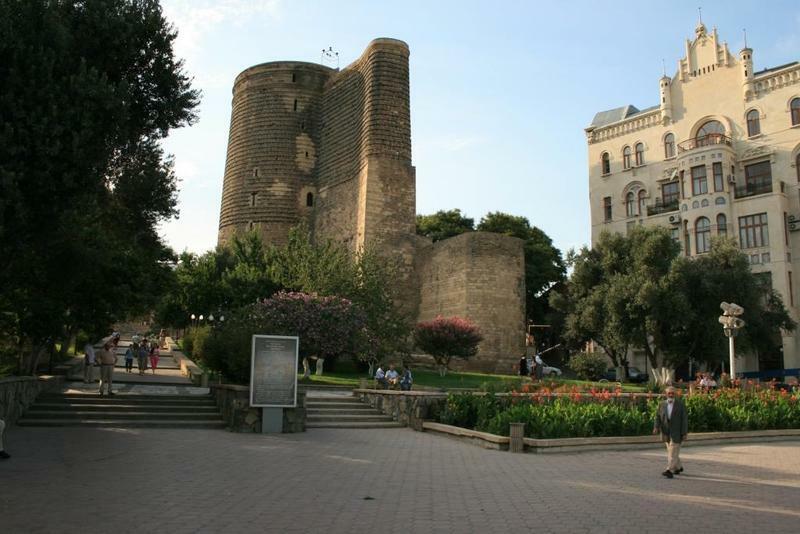 Justifiably, Old city- Icherishekher is regarded as the acropolis of Baku. Continue to Nizami Street, which was the main trade street of Baku for decades, now one of the favorite places of tourists and local people for shopping and entertainment activities. The sound of the water is taking you away- now you are at the Fountains’ Square of Baku. Tens of fountains all around are creating breathtaking ambiance. Time for a delicious lunch served in one of the local restaurants of amazing Baku. The day is dedicated for our breath-taking Absheron tour… Begin with a visit to Yanar Dag; One of the most famous and popular tourist places of the “eternal flame” in Azerbaijan is the mountain of Yanar Dag. It is located 25 km to the north from Baku, in Mehemmedi village. A 10m long wall of fire, that never extinguishes, is burning continuously alongside the edge of the hill, which naturally is at its most spectacular at night when tourists and locals alike view the fire from a nearby teahouse. Local lore states that it was a shepherd that accidentally ignited the fire in the 1950s by tossing a cigarette, and that it has burnt ever since. The famous French writer Alexandre Dumas also witnessed these flames. He expressed his feelings: “This is absolutely the most interesting and fascinating thing, which can be seen nowhere else,” he wrote. Even today, the flames never fail to amaze tourists and locals alike. These natural fires have always inspired humans , and played a crucial role in the creation of mystical faiths like Zoroastrianism, centered on ceremonial fire cults. According to one local, “A lot of sick people see the mountain in their dreams. And when they come here, they receive treatment. On the other hand, the health conditions of those who came here drunk, deteriorates.” Historical records are proof of this – Venetian traveler Marco Polo is said to have observed numerous flames all over the Absheron Peninsula on his visit to Baku in the 13th century. Yanar Dag is now a protected site, with extensive archeological studies being conducted in the area. Now, we continue to other Zoroastrian site of Absheron called Ateshgakh. This fire temple, with a mixture of Indian and Azerbaijani architectural styles, is a surviving proof of age-old relationship between the two countries. A wall surrounds the pentagon shaped building with a guest room over the gate (‘balakhane’). There are still some wall inscriptions in Sanskrit and Gurumukhi, including poems. Cells for pilgrims line the wall inside and surround the the main altar in the center of the temple – a quadrangular pavilion with the fire on the altar inside. Historians, archaeologists, and theologians have argued over the construction date of the temple. Some defend that there was a Zoroastrian temple in Surakhany since the 6th century, others delay that event for another seven centuries. After Azerbaijan was Islamized some Zoroastrians escaped to India. But trade links with India in later centuries, led to renewed contacts with the fire-worshippers, who had migrated from to Northern India. During 17th and 18th Century, the site was rebuilt by Indian merchants and masons, who had established in Baku their settlement. 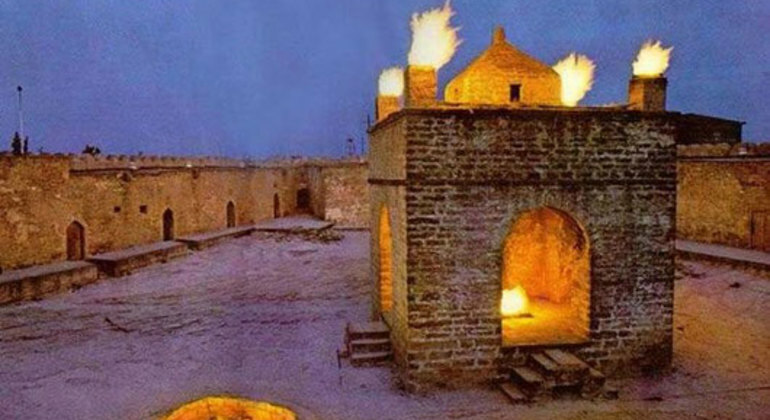 This fire temple, with a mixture of Indian and Azerbaijani architectural styles, is a surviving proof of age old relationship between the two countries. The pentagon shaped building is surrounded by a wall with a guest room over the gate (‘balakhane’). There are still some wall inscriptions in Sanskrit and Gurumukhi, including poems. Cells for pilgrims line the wall inside and surround the the main altar in the center of the temple – a quadrangular pavilion with the fire on the altar inside. Rise and shine to a beautiful morning and enjoy a delicious breakfast buffet. At 10. am our driver and guide will be waiting you in hotel lobby. Check out and leave the hotel for Qabala. it is approximately 3.5 hours drive to Qabala from Baku, but our journey will take longer as we will stop in many sights on the way. Our first stop is Diri Baba mausoleum in Maraza city. The building of the mausoleum is a wonderful example of Shirvan architectural school. On the building itself the construction date is mentioned as 1402 and architect’s name as “…the son of ustad Haji”. There are still many legends connected to this place. For a long time, local people believed that a sacred person- called Diribaba was buried here and remained imperishable across the centuries. Nowadays, it is still considered as one of the holy places for local residents. The monument is under protection and open to tourists. After leaving the Shamakhy, we continue to Qabala. However, there is one more place on the way you must see- this is Lahij. Many years ago there was a city of 36,000 people called La. One day there was a very big earthquake and La was flattened. It became nothing, and so was called La-hec. Hec is Azerbaijani for nothing, or zero. In time people came to live in the settlement again, and so it could no longer be called “nothing”, and the modern name of Lahij came about. 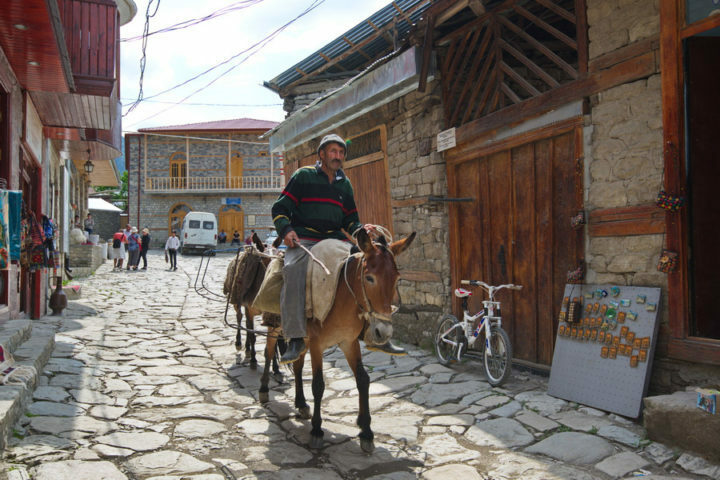 Today’s Lahij is a remote mountain village, comprising some 2,000 residents. Located in Ismayilly disctict of Azerbaijan, on the southern slopes of the Greater Caucasus Mountain Range at a height of 1211 meters above sea level, it is one of the oldest continuously habited places in the world. During the Middle ages, Lahij became the main centre of craftsmen in Caucasus. Lahij master craftsmen could create forty types of items related to Folk Art. These skilled craftsmen included jewelers, blacksmiths, carpenters, carpet makers, engravers, painters, tanners, shoemakers and bast shoe makers, sock weavers and others. Many valuable examples of the products of these skills are exhibited in famous museums and collections.The craftsmanship is still plays an important role in day-to-day life of ordinary Lahij residents. The village and the heritage is under protection, but open to tourists. We will take the opportunity here to have a lunch in Lahij village. After Lahij we will continue to Qabala and will arrive there within one hour. Out hotel is located in the center of Qabala. After check in and one hour rest, we will have a city tour to end the day. We will return back to the hotel to have a dinner to get prepared for tomorrow’s trip. You will start a day with wonderful breakfast. At 10. am our driver and guide will be waiting you in hotel lobby. The first thing we will do is to climb Tufandag- the highest elevated mountain resort in Azerbaijan to take a freshness of Caucasian Mountains. 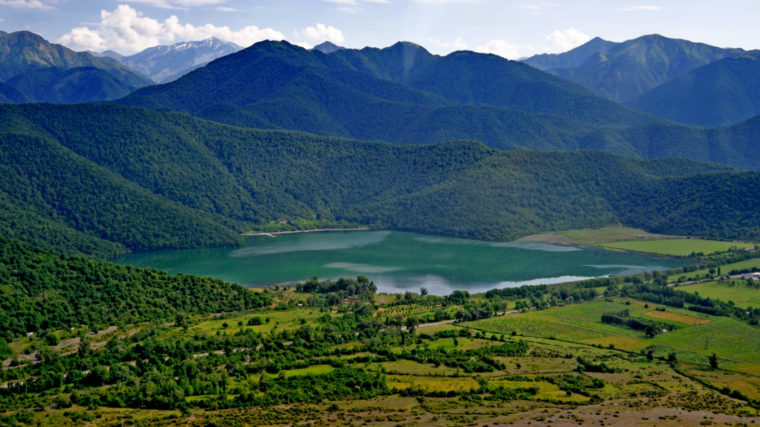 Tufandag is located 4 km away from the city of Gabala – the ancient capital of Caucasian Albania. From here, you can watch the incredible panorama of Caucasian mountains take incredible view for city. Our second stop is Nohurgol, a beautiful lake located 3 km away from Qabala. The lake is surrounded by a forest, you can walk around the lake. Here you can relax, even sail boat on the lake. After spending about an hour and half around this beautiful lake, now it is time to visit Chukhur Qabala- ruins of ancient Qabala city. In fact, Chukhur Qabala is a name of the village located on the banks of Alazan river. The village has about 913 permanent residents. The village itself was part of the ancient Qabala city – which was the capital of Caucasian Albania. 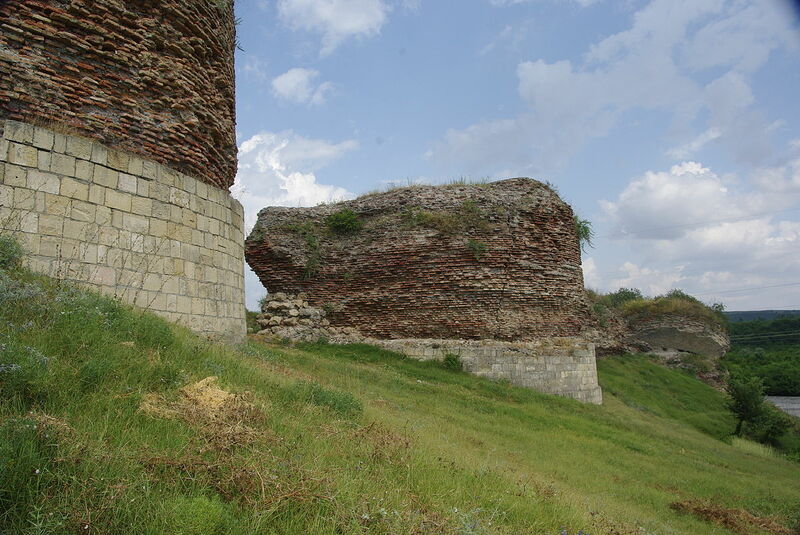 In the territory of the village, there are remains of castle and buildings. The site is under protection, but open to visitors. After studying Qabala and enjoying its incredible sights, you can continue your tour to Nij village. Nij – is the home of a special ethnic group among the Azerbaijani nationalities Udin, who are considered to be the descendants of the Caucasian Albanians. At present, their number is no more than 10,000 people, but they have managed to preserve their traditions, language and spiritual culture. Currently, the Alban Temple in the village of Nijh is also open, which is open to parishioners and tourists. This is one of the most ancient monuments of Christianity in Azerbaijan. The temple was rebuilt in the XVII-XVIII centuries on the site of an ancient Albanian church of the 4th century, founded by St. Elisey (Christian ecclesiast in Caucasian Albania). We will return back to the hotel to have a dinner to get prepared for tomorrow’s trip. You will start a day with wonderful open buffet breakfast. After check out from our hotel and packing all our luggage to the car, we start tour to Shaki city- one of the loveliest towns of Azerbaijan, dappled with tiled-roof old houses and topped off with a glittering little khan’s palace. Historic Sheki was originally higher up the valley around the site now occupied by Kish. That town was ruined by floods in 1716 but rebuilt by rebellious Khan Haci Çhalabi, who set up a defiantly independent khanate there in the 1740s. by a second, even more catastrophic flood in 1772, Nukha became the new royal capital. After 1805, when the khanate was ceded to Russia, Nukha continued to flourish as a silk-weaving town and was a trading junc­tion between caravan routes to Baku, Tbilisi and Derbent (Dagestan), with five working caravanserais at its peak. Nukha was re­named Şhaki in the 1960s. He built a second fortress at Nukha (today’s Shaki). When the original Shaki was obliterated.In Shaki we will visit Shaki Khans Palace, Shaki Old town and Karvansarai before lunch time. After having lunch we will leave the city for Baku. You will start a day with wonderful open buffet breakfast. Afterwards, we will depart to Quba city- north-west of the capital Baku. On the way to Guba we have some hidden gems waiting to be explored bu you. On Baku- Guba road, we will have 10 minutes stop at Beshbarmag dag (“five fingered mountains”). After enjoying the breathtaking panorama, taking some selfies and group photos, and possibly tasting some snacks sold around, we will drive to Khinalyg village first-one of most ancient settlements in the country where people have been continuously living for more than 5,000 years. 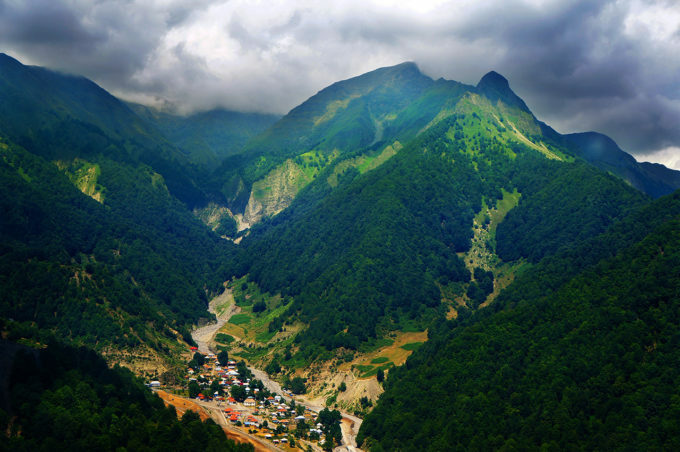 The village is located on the altitude of 2,000 m. This is the highest and most isolated settlement in the Greater Caucasus mountain range, located on the border with Dagestan, 63 km from Quba. Its residents numbering about 2,000 still retain unique cultural traditions, speak their own language and wear their own traditional clothes. Left the Khinalyg with full of memories, now we continue our trip to Quba- one of the largest cities in Azerbaijan.The city is located 170 km to the north of Baku right on ridges of Greater Caucasus. In the past Quba was the capital of Quba khanate which was founded in the mid 18th century. The unsurpassed beauty of the local mountains was praised by such famous people as Alexander Duma-father, the Russian writer Bestuzhev-Marlinsky, the Norwegian traveler Tor Heerdal and others. As we arrived at the hotel and check in now it is time to relax and get prepared for tomorrow. New beautiful day starts in Quba. After breakfast and check out we are ready to enjoy the day by exploring Guba and surrounding areas. Afurdzhin Waterfall-the highest waterfall of Azerbaijan. In translation from Russian, Afurdja means “a place where water splashes fall”. Indeed, the waterfall is very splashing. Gusts of wind in this place are strong, they blow the jet to the left, then, to the right, the drops fly in all directions. Qachresh forest- very old oak tree forest and amazing tourist attraction. Juma Mosque- 19th century mosque constructed in typical Quba province style mosques. Inside of the mosque there is a big hall crowned with a huge 16 m diameter dome. Old Hamam- located not far from the Juma Mosque, the hamam is unique in its beehive shaped dome made of brick. It is no longer operational as hamam but proves to be an interesting stop on any walking tour. Sakina-Khanum Mosque- another old mosque built in 1854 by the widow of Abbasgulu Bakikhanov. The mosque was built from red bricks and is similar to faceted cylinder. Each facet has a window in the form of a semicircular arch. The top of the facade is surrounded by an original eaves made from small bricks. From top this stately building is crowned with a big white metal dome in the shape of a multi-faceted helmet. The top of the dome is decorated by a graceful thin spike. Unfortunately, we have to live our lovely Quba for Baku as end of our tour here. We have 2,5 hour drive ahead. But before that we will visit to Quba 1918 Genocide Memorial Complex to pay our respects to victims of this tragedy and to learn more about the history of Azerbaijan. We arrived in Baku and checked in. Now, we have time to rest, or alternatively to have some quick Baku shopping tour. Wake up and start the day with a hearty breakfast buffet. Check out from the hotel soon after. Unfortunately, it is time for airport transfer now. Treasure the lovely memories gathered here with your fellow travelers as you depart to the airport for your return flight.